Mozilla revealed in mid-2018 that it had plans to improve the handling of different interface languages in the Firefox web browser. Firefox supported two options back then to change the language of the browser's interface: download and install language packs, or re-install Firefox using the installer of the desired language. Both options were inferior to how Google Chrome handled language changes. Chrome users can change the interface language directly in the browser without the need to install a language pack or re-install the entire browser. 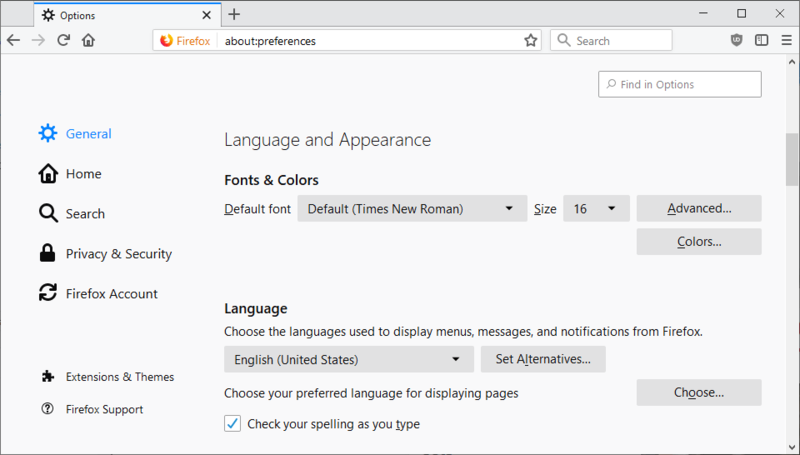 The release of Firefox 65 improves how Firefox users may change the browser's interface language. Mozilla integrated language switching options directly to the Firefox settings. Firefox users may still download a different language version of the web browser and install it over the current installation to change the language, but they don't have to if they run Firefox Beta or Stable. Firefox Nightly is excluded because strings change frequently in the browser. Load about:preferences in the browser's address bar. Scroll down to the Language and Appearance section. The current interface language is displayed under language. Click on "Set Alternatives" to add additional languages to Firefox. Select "Select a language to add" and then "Search for more languages". Firefox retrieves the list of supported languages from Mozilla. Click on "select a language to add" and pick one of the available interface languages to add it as a language in Firefox. Tip: tap on the first letter of the language's name to jump to the letter in the listing. Select Add to add the language. Firefox downloads the language pack from Mozilla and adds it to the browser. If a dictionary is available, it is also downloaded. Repeat the process for other languages that you may want to add. The order of languages determines the priority in which they will be used. You may use the move up or down buttons to change the order. Click on the ok button once you are done. Firefox displays a restart notification afterward if you changed the main display language. The restart notification is displayed in the old and new interface language. Select "apply and restart" to restart Firefox so that the new interface language is used. The preference intl.locale.requested determines the priority of languages in Firefox. The preference is only available if two more more languages are installed in the browser. Mozilla hopes to improve the process further in future versions of the Firefox web browser. One possibility that is discussed currently is to complete the migration to Fluent; this would enable restartless language switching and support for non-English fallback locales. Firefox falls back to English automatically if a string is missing from a language file. 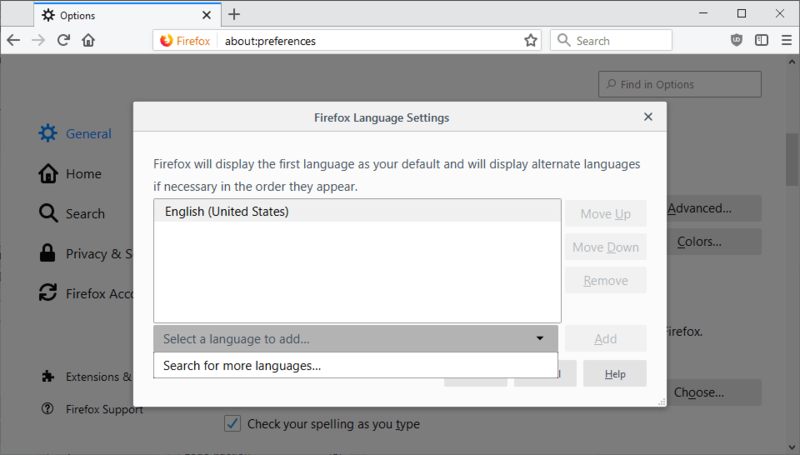 The new language changing options in Firefox 65 improve the process significantly. Everything that is needed is included in Firefox or downloaded automatically from that version of the browser on. While the total number of Firefox installations that have their interface language changed is unclear, it does not appear that uncommon of an operation. Now You: Did you ever changed the interface language in a browser? Want to change the Firefox language? Find out how to change the language that Firefox uses to display interface elements. Martin, every time i log in to this site (WP) i get a message that says:”WordPress 5.1.1 is available! Please notify the site administrator.” – probably nothing to care about, but i wanted to notify You about that. After the language change whats happen with to the extensions language? Changing Chromium to russian also changes uBlockOrigin to russian. Idk about Firefox, seeing how primitive the multilanguage support still is, whether it knows how to handle multiple language strings of extensions or not… It’s up to you to try. They also change. I downloaded the English version of Firefox 66.02 don’t know why, normally it takes up the default language of my browser, Dutch. I changed the language settings and these also apply to extensions language. Everything will change unless a translation hasn’t been done. I never change a browser’s interface language, not that of Firefox anyway. I install and keep en-us though the device is in France. Why en-us? All goes back to when I discovered Firefox (versions 2.x, lol) : having it deployed in French was problematic for me when trying to understand options and features by searching their explanation on the Web : most pertinent information was in English. So I switched to the en-us interface which allowed me to better correlate my questionings with explanations : from there on I kept the English interface. Why only one language interface? Because I heavily css tweak the browser and several extensions and that these tweaks sometimes consider built-in data code dependent of the language interface, which means that I’d have to change some of these tweaks accordingly to the interface language. “No, Martha, I’m not talkative, I’m only trying to explain. And don’t complain honey, it’d be worse in my native French language!”- Lol. I can’t speak for FF because I don’t use it, but for Waterfox the UI language can be changed via the Local Select menu in prefs/general. Been like that for a long time.